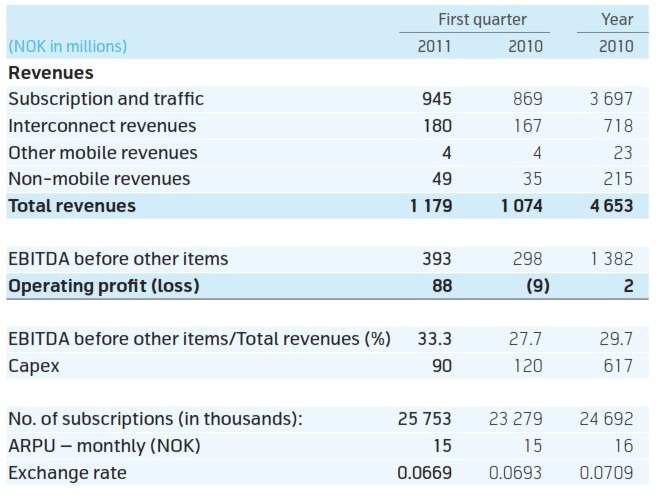 Telenor group today announced its results for first quarter 2011, according to which, Telenor Pakistan showed 9.7 percent in Norwegian currency, due to increased share from tower sharing and Easypaisa revenues. Telenor in its financial report said that group’s Pakistani arm generated a total of 1179 million NOK or 18.769 billion rupees, up from 1074 million NOK or 17.098 billion rupees (according to current day exchange rate) during same period last year. Company said that The EBITDA margin increased by 6 percentage points, as revenues increased and costs related to leased lines declined. Telenor said that it continued to focused on network capacity investments to align with subscription growth and traffic volumes to decrease capital expenditure . With 26% cash flow margin, Telenor says that company is on track to deliver good returns in Pakistan. Telenor Pakistan said that it added 1 million subscriptions during the said quarter. ARPU in NOK remained unchanged, while it showed 2% increase in local currency. Wish k yeh sara paisa instead of norway pakistan mein he use ho. Now they have gain lot of revenue so they should give some extra advantage to there consumer as well as the country. they’ll never do any good for us. The meanest company ever. Gaining profit by deception. Customer ne tu kabhi khush nahi hona, chahay in ko free calls bhi offer ker do. yaar itni controversy kay baad bhi, telenor is on top interm of revenue and users. very strange:( ye tu awam theek nahi or statistics theek nahi? 1) they are re-investing most of the reserves for easypaisa, they didnt buy tameer bank from donations! 4) which ceclo started campaign like karo mumkin show? lots of other examples as well. so kindly, think before u write lame things, they are much better than our own UFONE. No one has real 4G deployed. A lot of places that say 4G r really WiMax. This is indeed a great news and Telenor is rightly on the track with a focus on customer satisfaction. Telenor has done remarkable job as a socially responsible company and Telenor Pakistan always came forward whenever some hard time can to people of Pakistan. Telenor Group and Telenor Pakistan employees generously donated for flood victims and also participated in volunteer efforts. Telenor has emerged as a company which doesn’t exist just for earning money, rather it’s striving for social uplift of the people of Pakistan. A TIGHT SLAP ON KASHIF , YASIR ,SUMAIR . hahaha…. very funny u are man. come in the reality world. u are forgetting all type of controversies about telenor. or u dont want to see the real pic. telenor itself is a ___ against ppl like faisal. Pathetic voice quality n coverage. If they’v errected a tower in ur area, it doesnt mean that they’re done. ____ ppl use telenor n waste their money for them. European standard ____. telenor has invested over $2b in pakistan. to my knowledge not a single cent has been given back to the shareholders yet. it invests in its “pakistani” employees who get exported to international assignments and send back zareimubadla to pakistan. its “pakistani” franchisees are the most well respected and profitable in telecom trade.